Cathay Pacific and ZIP SIM Give Free Travel SIM Cards to Canadians Flying to the U.S.
VANCOUVER, BC--(Marketwired - September 28, 2016) - Cathay Pacific Airways, one of the largest airlines in Asia, today announced a partnership with travel SIM card provider, ZIP SIM, to give away free talk, text, and data to Canadian travellers heading for the United States. Select Cathay Pacific passengers travelling from Vancouver to New York will be offered a free ZIP SIM card and plan - either a 3- or 7-day Talk+Text+Data plan with unlimited U.S./Canada calling, global messaging, and 500MB of 4G LTE data. At launch, SIM cards will only be offered to travellers departing from Vancouver, Canada; however, the partnership will expand the offer into other departure and arrival cities throughout Canada and around the world. Today, Cathay Pacific operates 30 flights into the United States, carrying 2.8 million passengers each month. In 2015, Canadian travellers made nearly 45 million trips into the United States despite the falling Canadian dollar. "Canadians today are still paying some of the highest roaming fees in the world," says Oren Chervinsky, Vice President of Global Sales and Marketing for ZIP SIM parent company, Otono Networks. "Together with Cathay Pacific we are giving travellers the opportunity to forget about the hassles and expense of roaming fees and stay connected with friends and family while enjoying their trip." 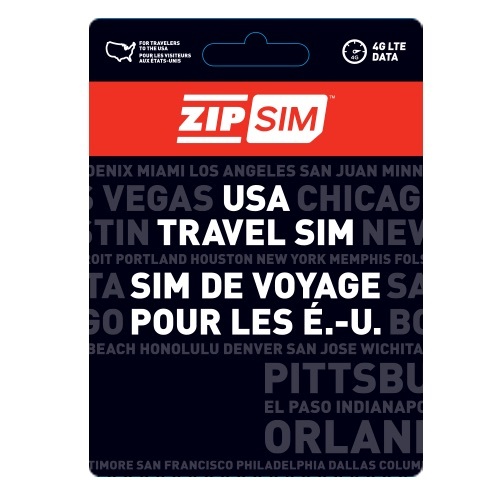 ZIP SIM focuses on short-term, contract-free cellular service for travellers in the U.S. with plans ranging from 7 to 30 days in length. The plan is pre-loaded onto a SIM card, which means customers simply choose their type of plan - either talk, text, and data or data-only - and insert the SIM when arriving in the U.S.
For Cathay Pacific customers not eligible for the free ZIP SIM offer, there will be a discount on the purchase of any ZIP SIM for future trips, as well as Otono's other popular travel service, Roam Mobility. For details on Roam Mobility, visit www.roammobility.com. About Cathay Pacific - Cathay Pacific offers 14 flights weekly non-stop between Vancouver and Hong Kong (growing to 17 flights weekly from 28 March 2017), 10 flights weekly from Toronto to Hong Kong, and daily non-stop service Vancouver to New York (JFK), plus dedicated freighter service to Hong Kong from Vancouver, Toronto and Calgary. Also, from the convenient hub of Hong Kong, the airline offers seamless connections to an extensive Asia network, including over 23 cities in Mainland China. More information, including current fares and availability, may be found by visiting the airline's website: www.cathaypacific.com/CA, Facebook page: www.facebook.com/cathaypacificCA, Twitter: @CathayPacificCA or Instagram: @CathayPacific. For North American reservations, dial toll-free: 1-800-268-6868. About Otono - Otono Networks, Inc. is an emerging global technology based telecom with multiple carrier-supported networks out of Vancouver, Canada. Otono's platform is primarily focused on flexible, global connectivity and mobile enablement solutions using both traditional SIM and eSIM technologies, allowing easier and faster network integration. Otono is the parent company of several mobile services, including Roam Mobility for USA, Roam Mobility for Canada, ZIP SIM, and AlwaysOnline Wireless. For more information about Otono, visit www.otono.com.